In my special education classroom, I come across different needs every year and sometimes multiple times of year where I need a new visual schedule of some sort. I have tried to save visuals in a file cabinet so I can use them again if needed. I'm not very good at recycling the visuals as I tend to make them personal for the student that needs them. I find they work best, the more intuned with the student they are. But I keep trying to organize so in case I can reuse....I know where they are. One way I do this is to have them organized in notebooks. I use plastic file folders, hole punch them on the fold side and place them in 3 ring binders. I either use velcro or magnets to affix the to the plastic folder. Then I try and group them into similar topics such as transition schedules, breakfast schedules, lunch schedules etc. 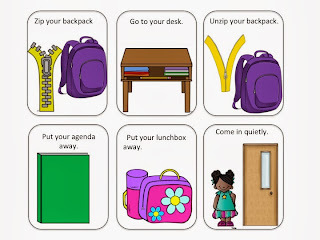 For your freebie today, I thought I would share some of my unpack/pack up visuals I 'm just starting to use with a new students. Free Visuals today for Marvelous Monday FREEBIE!!! Click to get yours! I have students that need schedules for every step of the morning routine. You know...enter the classroom, sit at your desk, put your backpack on your desk, unzip your backpack, get out your lunchbox, your daily communication notebook. Put your lunchbox and your communication notebook in their assigned spots. Hang up your back pack and end up at the rug area for morning meeting, so I am in the process of making them for her. All of my students use visual schedules to transition throughout their daily assigned tasks. Even my task boxes have a schedule to tell the students which boxes to do each day or each week. On the right you will see my daily schedule the student use. When the student finishes as task they remove the card from the top and place it in the pocket at the bottom. A clear column mean the student has completed their assigned work. I have 4 students that currently do these task boxes. Under the title you are the names of the 4 students. Under each student name are the number of the task boxes that student is to complete each day. Each week, I change the numbers for each student so they work on different boxes. This year I am working with the Occupational Therapist that serves my students to set up a mobility lab. I am really excited about it as the majority of my students have issues with gross motor, fine motor and general motor planning issues. Below you will see a portion of the schedule I am going to use for the mobility lab. The first column on the left is for one student and another student's schedule is in the right column. I am planning on 9 total stations but we have to teach and build up the stations slowly. I will share more about this as it develops. I will tell you that we are using the book Ready Bodies, Learning Minds by Athena Oden, P.T. Enjoy the FREEBIE and have a great week! I'm finding that even my regular kids this year need visual schedules, traditional verbal schedules aren't enough, something I've not experienced before. I like the personalization you discuss. I might need to try this. Thanks for sharing! 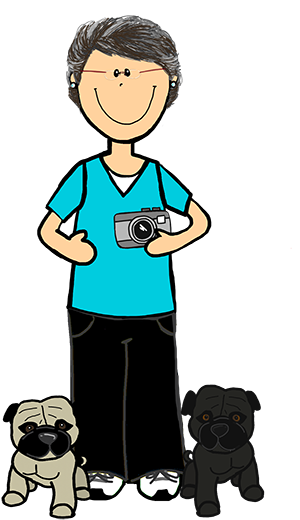 I teach special education in middle school and enjoy your blog! Thanks for all you share!